DPA has launched a new d:vote™ CORE 4099 instrument microphone that boasts CORE by DPA amplifier technology, has a brand new streamlined design and is being rolled out across the entire range of 4099 Instrument Microphone kits. In order to minimise distortion and increase the dynamic range of its miniture microphone capsules, DPA developed the CORE by DPA amplifier technology to produce even clearer sound from the industry-leading miniature microphone capsules. The dynamic range has been expanded in all CORE by DPA capsules, by up to 14dB. For the d:vote CORE 4099 mics, the dynamic range has gone from 100 dB to 108 dB for the Loud SPL and from 95 dB to 109 dB for the Extreme SPL versions. Audibly, CORE by DPA gives the microphones a more clear and open sound across the whole level range. The d:vote™ CORE 4099 mics will replace the hugely successful Legacy versions of the 4099 mics and are available in all existing instrument kits, which include a mic, cable, XLR adapter and suitable instrument clip. DPA are also adjusting the 4- and 10-Kits clips to include the SM4099 (stand) and CM4099 (clamp) mounts. You get an assortment of 25 clips with the 10-kit and 10 clips with the 4-kit variations. 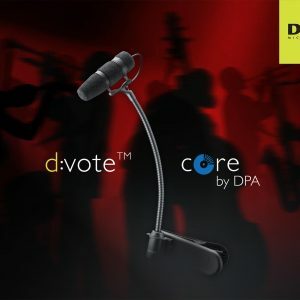 For the new d:vote™ CORE 4099 microphones, DPA has designed a new streamlined form with a more distinguished foam cover that helps decrease vulnerability to wind or movement during a performance. To make it easier for users to tell the difference between the two versions available, the new d:vote CORE mics are color-coded at the bottom of the mic: a red mark represents Loud SPL and a yellow mark represents Extreme SPL. DPA d:vote™ CORE 4099 Instrument Mics are available now from all official DPA Retailers in the UK and Ireland. If you have any questions or are unsure of which mic to get, please get in touch.